Area: 702 sq. km (about 270 sq. mi.) in four major island groups (Pohnpei, Chuuk, Yap, and Kosrae). Cities: Capital: Palikir. Other cities — Kolonia, Weno, Colonia, Lelu. Terrain: 607 mountainous islands and low-lying coral atolls. Nationality: Noun and adjective: Micronesian. 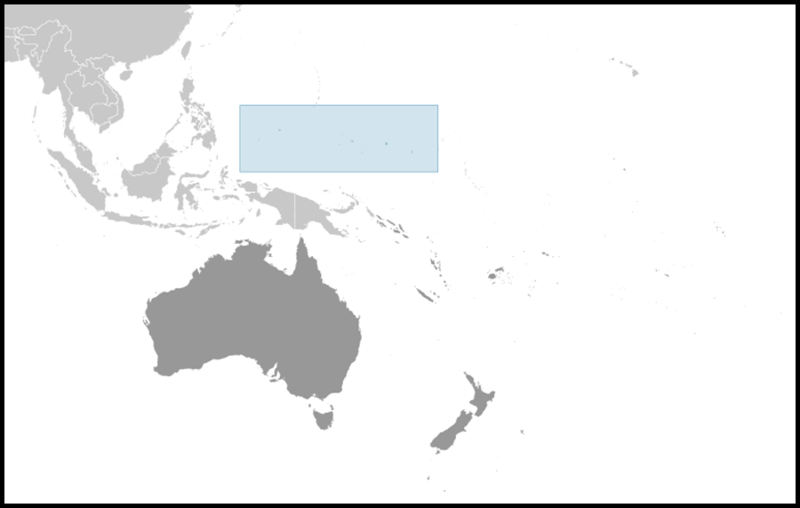 Ethnic groups: Nine ethnic Micronesian and Polynesian groups. Religion: Roman Catholic 50%, Protestant 47%, others 3%. Language: English and nine ethnic languages. Health: Life expectancy: male 67.6 years; female 69.1 years. Infant mortality rate — 13/1,000. Work force: More than 50% of workers are government employees. Type: Constitutional confederation in free association with the United States. The first Compact of Free Association entered into force in 1986, and an Amended Compact entered into force June 30, 2004. Independence (from U.S.-administered UN trusteeship): November 3, 1986. Branches: Executive: President (chief of state and head of government), cabinet. Legislative — unicameral Congress with 14 seats. Judicial — Supreme Court. Major political parties: No formal parties. GDP per capita (nominal): $2,702. National income (GDP + foreign assistance): $399.7 million. National income per capita: $3,227. GDP composition by sector: Agriculture 15.8%, fisheries 11.5%, manufacturing 0.4%, tourism 2.1%, construction 3.5%, distribution 14.4%, government 12.6%, education 12.9%, health 4.6%, other services 22.2%. Industry: Types: fishing, agriculture, tourism, construction, craft items. Trade: Exports ($24.9 million): fish, kava, betel nut. Export market — Japan (21%), United States (25%), others (53%). Imports ($152.9 million) — food, manufactured goods, fuel. Import sources — United States (50%), Japan (11%), others (39%). The Federated States of Micronesia (FSM) consists of 607 islands extending 1,800 miles across the archipelago of the Caroline Islands east of the Philippines. Approximately 100 islands are inhabited. 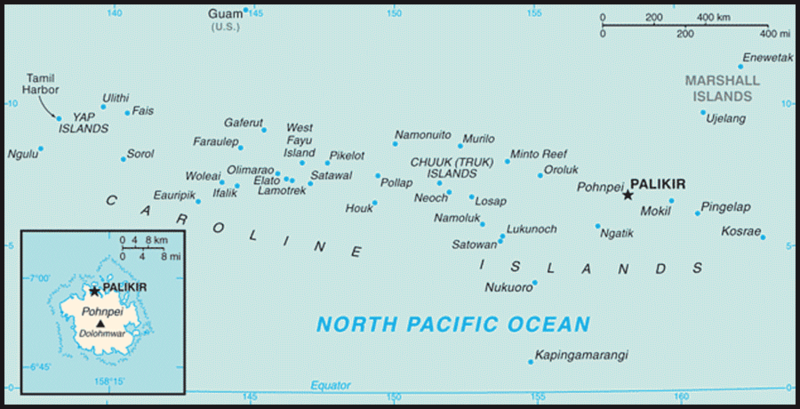 The four states are the island groups of Pohnpei, Chuuk, and Yap, and the island of Kosrae. The federal capital is Palikir, on Pohnpei. The indigenous population consists of various ethno-linguistic groups. English has become the common language. The birth rate remains high at more than 3%, but the population of the four states remains almost constant due to emigration. Ancestors of the Micronesians settled the Caroline Islands over 4,000 years ago. A decentralized chieftain-based system eventually evolved into a more centralized economic and religious empire based principally in Yap and Pohnpei. European explorers — first the Portuguese in search of the Spice Islands and then the Spanish — reached the Carolines in the 16th century, with the Spanish establishing sovereignty. The current FSM passed to German control in 1899, and then through the Treaty of Versailles to the Japanese in 1919. Following World War II, these islands became part of the United Nations Trust Territory of the Pacific Islands, administered by the United States. On May 10, 1979, four of the Trust Territory districts ratified a new constitution to become the Federated States of Micronesia. The neighboring trust districts of Palau, the Marshall Islands, and the Northern Mariana Islands chose not to participate. The FSM signed a Compact of Free Association with the United States in 1986. An Amended Compact entered into force in June 2004. The FSM is governed under a 1979 constitution, which guarantees fundamental human rights and establishes a separation of governmental powers. The unicameral Congress has 14 members elected by popular vote. Ten senators represent single-member districts based on population and serve 2-year terms. Four senators at large — one from each state — are elected to serve 4-year terms. The President and Vice President are elected by Congress from among the 4 at large senators. Once elected, the President and Vice President serve for 4 years. Their congressional seats are then filled by special elections. An appointed cabinet supports the President and Vice President. There are no formal political parties. The FSM is a confederation with a weak central government. Each of the FSM's four states has its own constitution and its own elected legislature and governor. The state governments maintain considerable power, particularly regarding the implementation of budgetary policies. The FSM's highest court is the Supreme Court, which is divided into trial and appellate divisions. The President appoints judges with the advice and consent of the Congress. The FSM maintains an Embassy at 1725 N Street NW, Washington, DC 20036. Telephone: 202-223-4383. Fax: 202-223-4391. email: http://www.fsmembassydc.org. The FSM also maintains consulates in Honolulu and Guam. Under the terms of the Compact of Free Association, the United States provided the FSM with about $2 billion in grants and services between 1986 and 2001. The Compact's financial terms were renegotiated for the 20-year period 2004 through 2023, with the aim of encouraging sustainable development. The United States will provide almost $100 million in direct assistance every year until 2023, which includes the systematic reallocation of a portion of the direct aid to a jointly managed Trust Fund. Additional federal grants to the FSM are estimated to be as much as another $100 million annually. Assistance under the Amended Compact is distributed by grants in response to a transparent FSM budget process, focusing on the following six sectors: education, health, infrastructure, public sector capacity building, private sector development, and the environment. The U.S. Department of the Interior is responsible for monitoring and implementing the Amended Compact. The FSM government sector plays a central role in the economy as recipient and domestic administrator of Compact funds. The national and state-level governments employ over half of the country's workers. Government services and public enterprises account for nearly 40% of GDP. Real wages nationwide have been flat and the number of jobs in the economy (about 15,500) has declined since 1996. Private sector jobs pay about half as much as public sector jobs. The fishing industry is very important. Foreign commercial fishing fleets pay $15 million to $20 million annually for the right to operate in FSM territorial waters. These licensing fees account for over 30% of the national government revenues. Exports of marine products, mainly to Japan, accounted for nearly 61% of export revenues in 2009. Visitor attractions include scuba diving, surfing, World War II battle sites, eco-tourism, and the ancient ruined city of Nan Madol on Pohnpei. The islands have more than 24,000 tourists and visitors each year. 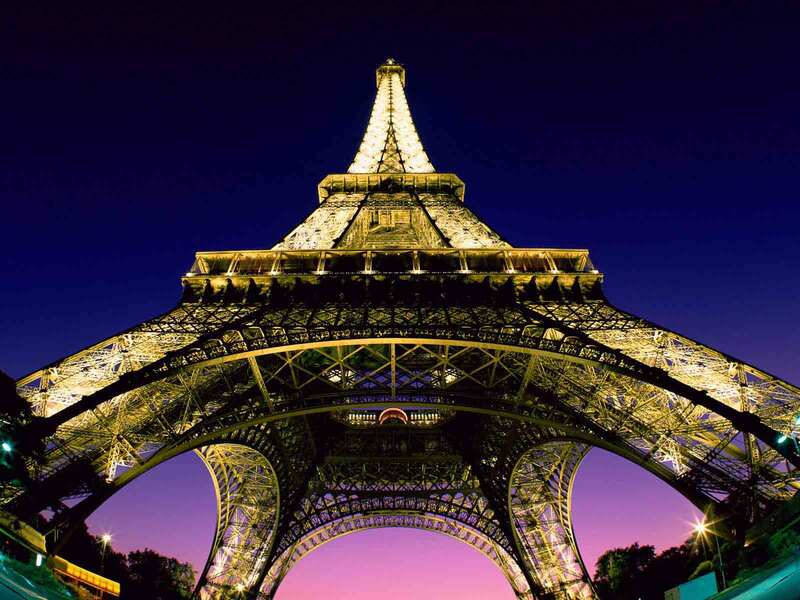 However, the tourist industry has been hampered by a lack of infrastructure, limited commercial air connections, and a severely restrictive foreign investment climate. The Asian Development Bank (ADB) has identified tourism as one of FSM's highest potential growth industries. Agriculture is mainly subsistence farming. The principal crops are breadfruit, coconuts, bananas, betel nuts, cassava, taro, and kava. Betel nut is becoming an increasingly important export with a yearly value estimated at $2 million to $4 million. The large inflow of official assistance to the FSM allows it to run a substantial trade deficit — imports outstrip exports by a six-to-one ratio — and to have a much lighter tax burden than other states in the region (11% of GDP in FSM compared to 18%-25% elsewhere). In 2004, the FSM Government and Congress started steps toward establishing a nationwide tax system to improve collections and more fairly distribute the tax burden with assistance from the ADB, the Pacific Finance Technical Assistance Center (PFTAC), and the Australian Government, who lately funded a consultant to write legislation, but the tax system remains unchanged. In 2011 the FSM Congress approved the first of five laws required to implement the new system. The Government of the Federated States of Micronesia conducts its own foreign relations. Since independence, the FSM has established diplomatic relations with a number of nations, including most of its Pacific neighbors, Japan, Australia, and the People's Republic of China. Regional cooperation through various multilateral organizations is a key element of its foreign policy. The FSM became a member of the United Nations in 1991. The Governments of the FSM and the United States maintain deep ties and a cooperative relationship. Reflecting a strong legacy of Trusteeship cooperation, over 25 U.S. federal agencies maintain programs in the FSM. Under the Compact, the United States has full authority and responsibility for the defense and security of the FSM. This security relationship can be changed or terminated by mutual agreement. Also under the Compact, Micronesians can live, work, and study in the United States without a visa. Micronesians volunteer to serve in the U.S. Armed Forces at approximately double the per capita rate as Americans; they are also eligible for admission to U.S. Service Academies. Americans can live and work freely in the FSM without the need for a visa. The United States will provide about $100 million annually in assistance to the FSM until 2023. A Joint Economic Management Committee (JEMCO), consisting of representatives of both nations, is responsible for ensuring that assistance funds are spent effectively, with the aim of fostering good governance and economic self-reliance. The basic relationship of free association continues indefinitely. The United States is the FSM's largest trade partner. See the FSM Country Commercial Guide at (http://www.buyusainfo.net/) for further information on the business climate of the FSM.